Kick showed a good jump on its 3rd Saturday and Sunday. 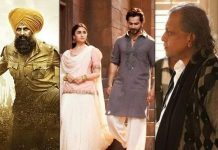 The film collected 2.94 crores on its 3rd Saturday and 3.5 crores yesterday, thus taking its total collections to 223.41 crores at the domestic box office. The Salman Khan starrer had a decent Friday and was expected to soar on its third weekend. In spite of being in the third week and also with the release of Akshay Kumar’s Entertainment, that had a bigger screen count, Kick managed to put up good show in the weekend. The action drama is expected to slow down in the weekdays, as the Akshay Kumar starrer is doing quite well. The film showed a 30% growth from its Friday collections and going by this, the film which already the Highest Grosser of 2014 is expected to beat Shah Rukh Khan’s Chennai Express’ lifetime total of 226.70 crores at the Box Office in India. Bhai is Bhai …He has re written all the records wit this one.